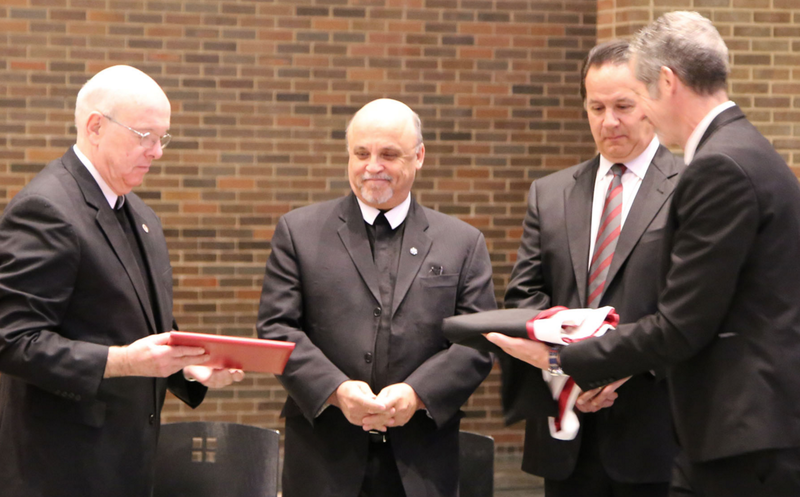 Lewis University in Romeoville, Illinois, honored Brother Superior General Robert Schieler, FSC, with an honorary doctoral degree during its Spring Convocation April 7, 2016. Lewis awarded the degree to Brother Robert to celebrate his many accomplishments and leadership. “Brother Robert, as Superior General, is exceptional in his work with the global Lasallian Movement to ‘find and experience God together’ as proposed by Saint John Baptist de La Salle,” said Brother James Gaffney, FSC, President of Lewis University. Brother Robert encouraged the audience of Lewis University students, faculty and staff to follow the Lasallian mission in their studies and work. “You are doing the work. You are keeping the mission alive. Thank you for what you do,” he said. Last year, several other Lasallian colleges and universities honored Brother Robert, including Christian Brothers University in Memphis, Tennessee, and La Salle University in Philadelphia, Pennsylvania, in May 2015, and Saint Mary’s College of California in April 2015.